No matter how big or small your office is, you need to make the most effective use of the space you have. You do that by giving everything a home. We’ve all heard the phrase: “a place for everything and everything in its place.” It pretty much sums up what organizing is all about. Once you’ve put like with like and weeded out the extraneous items, you’ll be left with only the essential items that need homes. If you like using a traditional file cabinet, make sure it is well made and the drawers slide easily. You can also used portable file boxes, rolling carts, stacked bins or magazine holders. A wall-mounted magazine rack can be used for items that require action like bills to pay, phone calls, events to calendar, etc. 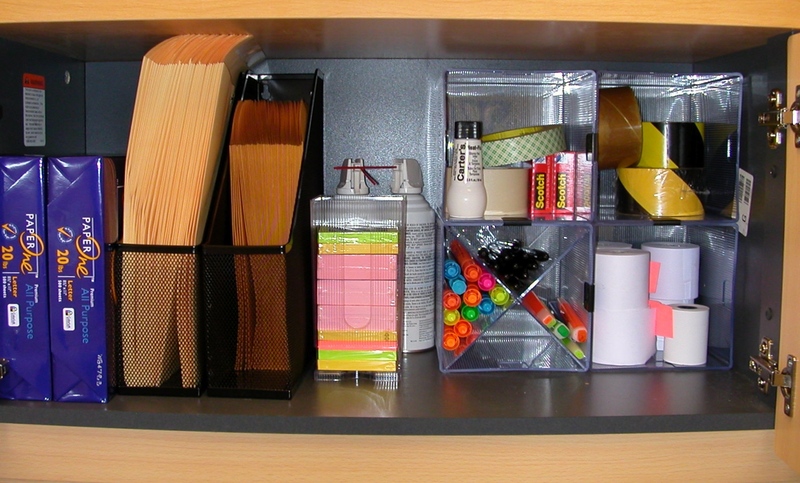 Keep action items close at hand and reference materials further away. Even better, go paperless. Set up automatic bill pay, scan receipts and use Evernote to save online articles. Only keep on your desk the items you use everyday, like pens and pencils, stapler, sticky notes and scratch pads. Store a supply of printer paper, labels, envelopes near the printer and blank CDs or thumb drives within easy reach of your computer. Take the doors off a closet and install shelving for extra supplies or archives. Take advantage of your vertical space. Install shelving on a wall adjacent to your workstation for books and notebooks and frequently used supplies. If you prefer closed shelves, install kitchen cupboards on your office wall. There’s no rule that they must be used in a kitchen. Take into consideration your visual preference – do you like things to be in sight all the time or are you bothered by “visual noise?” Remember, keep things where you use them, and store like with like, and you’ll have an organized home office in no time! Previous post: Write Your Holiday Letter NOW!